A patented process to control the degradation of plant material during composting has earned Professor Keith Waldron from the Institute of Food research the award of Most Promising Innovator in a national competition recognising bioscience research. The annual competition is organised by the Biotechnology and Biological Sciences Research Council. There were six finalists and winners in three categories as well the overall prize of Innovator of the Year. 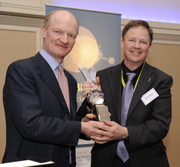 The awards and prize money were presented by David Willetts MP at a ceremony in London last night. 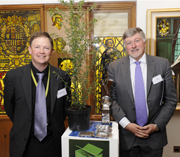 Professor Waldron received a trophy and £5000. “When I saw the competition I thought this might be a good opportunity to highlight the innovative activities of the IFR and our project partners. I am very grateful for the recognition provided by the award,” said Professor Waldron. The invention has enabled him, with the help of industry partners, to produce a growing medium with sufficient plant structure to provide an alternative to peat. The peat replacement is generated from food chain wastes so offers the potential to reduce pressure on British (and Irish) peat bogs and to create a use for waste material that might otherwise end up as landfill. Around 3 million cubic metres of peat is used annually in the UK horticulture market, damaging the use of peat bogs as carbon stores and as important habitats for biodiversity. Sphagnum peat is the main growing medium used by growers, prized for its water holding qualities, structure and aeration. These qualities are derived from the plant structure of partially decayed mosses and other bog plants. Commercial composting usually destroys plant tissues, leaving an unreliable product for horticulturalists. Professor Waldron invented a process to retain sufficient structure to produce high quality growing media. The Innovator of the Year Award is a competition designed to recognise and reward scientists who are ensuring that the UK’s excellent bioscience research is translated into outcomes that positively affect quality of life for everyone. The award, now in its third year, was established with a view to encouraging researchers to consider the potential of their research and take the necessary steps to maximise the social and economic impact of the excellent work they do. The six finalists were selected by an independent judging panel. They presented to the judging panel the day before the networking event and were all in attendance at Glazier’s hall for the announcement. Dr Celia Caulcott, Director of Innovation and Skills, BBSRC said “Congratulations to all three winners. We are delighted to be able to recognise and reward them for their commitment and achievements. There is great potential in the UK for world class research to lead to world changing technologies, products and policies and these researchers are fantastic examples of what is possible when innovation is successfully pursued. The research and development was funded by the BBSRC, Defra, the Technology Strategy Board and the Horticultural Development Company. The project partners have been ASDA, Bulrush Horticulture Ltd, the Association for Organics Recycling, Del Monte Fresh Produce (UK) Ltd, Diverse Technologies Ltd., Farplants Sales Ltd, the Horticultural Development Company, the Institute of Food Research, Organic Recycling Ltd, Carlsberg, Madestein (UK) Ltd and Lincolnshire Herbs Ltd. 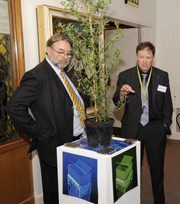 The research has been supported by the UK government through Defra, the Technology Strategy Board (TSB) and BBSRC. The mission of the Institute of Food Research (www.quadram.ac.uk) is to undertake international quality scientific research relevant to food and human health and to work in partnership with others to provide underpinning science for consumers, policy makers, the food industry and academia. It is a company limited by guarantee, with charitable status, grant aided by the Biotechnology and Biological Sciences Research Council (www.bbsrc.ac.uk). Innovator of the Year and the Excellence with Impact award recognise individual and institutional commitment to realising the social and economic potential of excellent research. Innovator of the Year has been awarded twice previously, in 2009 and 2010. Prize money in 2011 totals £20,000 with two category winners receiving £5,000 and one category winner who is also awarded the title of Innovator of the Year receiving £10,000. The award is to be spent at the winners discretion to support their research, training or other activities promoting economic or social impact, providing it falls within BBSRC’s sphere of interest. The Excellence with Impact award competition began in December 2008 and ran over a two year period. On 24 March 2011 BBSRC will award a total of £300,000 to the bioscience departments that are embedding a culture that recognises the importance of deriving economic and social impact from excellent research. One award will go to the department that has been most effective in introducing a significant culture change, which values impact as well as research excellence and the other will go to the department that can best demonstrate the achievement of economic and social impact from its research. A further £50,000 of prizes will be available for runners up in these two categories. BBSRC is the UK funding agency for research in the life sciences and the largest single public funder of agriculture and food-related research. Sponsored by Government, in 2010/11 BBSRC is investing around £470 million in a wide range of research that makes a significant contribution to the quality of life in the UK and beyond and supports a number of important industrial stakeholders, including the agriculture, food, chemical, healthcare and pharmaceutical sectors. The Babraham Institute, Institute for Animal Health, Institute for Biological, Environmental and Rural Studies (Aberystwyth University), Institute of Food Research, John Innes Centre, The Genome Analysis Centre, The Roslin Institute (University of Edinburgh) and Rothamsted Research. Defra’s Horticulture LINK is a pre-commercial research programme aimed at supporting the sustainability of the home horticulture industry, integrated with wider environmental and consumer interests. It has resulted in the partnering of more than 170 companies and 30 research organisations through 40 practically-focussed project awards.